Comic-Con Day 2 Video Recap - Watch it in Full! Welcome to Bob $tencil's Comic-Con 2008 Headquarters! Who is he? Bob Stencil used to fly planes for Braniff International, but in 1982 they went bankrupt. Since then he's been crooning, MCing, and playing and teaching poker in Southern California, Las Vegas, and Reno. Every year he travels to the San Diego Comic-Con to chat with old friends, hit on celebrities, and spread the word on moustache love. 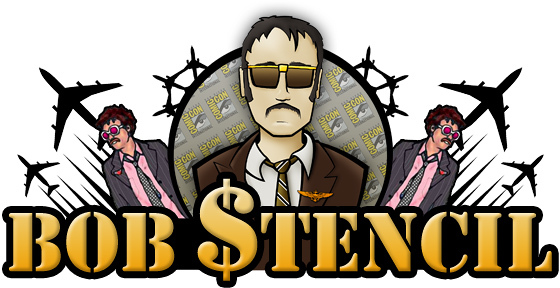 Bob $tencil is returning to Comic-Con 2008 yet again to take on the year's biggest and baddest comic convention in style. The latest video updates can be seen below! Bob $tencil: King of Comic-Con 2008 Final Video! Comic-Con Day 4 Video Recap! Comic-Con Day 3 Video Recap! Comic-Con Day 2 Video Recap! Comic-Con Day 1 Video Recap! New videos and blog updates will be added here as they arrive from San Diego.